At first I thought it was a real house, I was like what? Houses falling from the sky? That's cool...it looks like it's from Wizard of Oz. Sweet. Think I could convince them to do that to MY house? That was my first thought too, Erin. It does look like it's from the Wizard of Oz. cool. it looks (from the sign on th side of the building) that it's a mueseum? 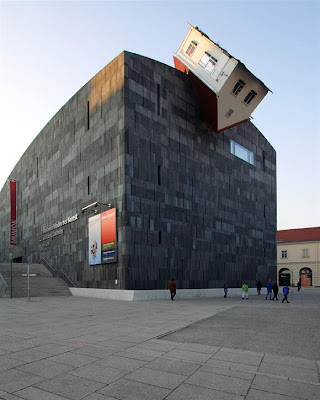 I thought that it was osme wierd form of art where they attached a fake house to a building. Eek. how did it get up there?who did that? Reminder! Send Your Portraits of Iris McLeod!